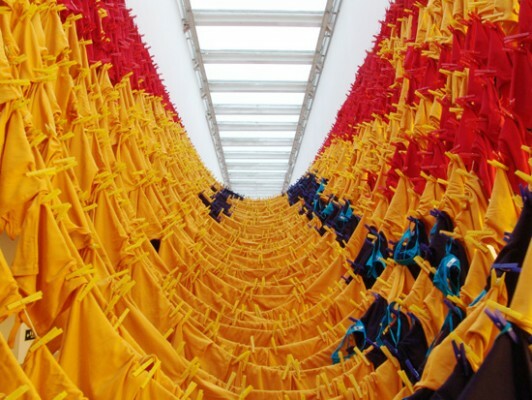 What do American Apparel and conceptual art have in common? Unless encouraging the continued abuse of v-neck t shirts by the male population is considered conceptual art, then you’d probably guess nothing. Yet the company famous for it’s sweatshop-free production and controversial advertisements has managed to become involved in an ambitious architectural project. 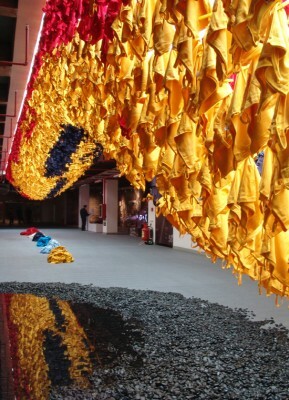 A collaboration with Ball Nogues has resulted in ‘Built to Wear’, an installation specifically designed for the 2009 Shenzhen Hong Kong Biennale of Urbanism and Architecture. 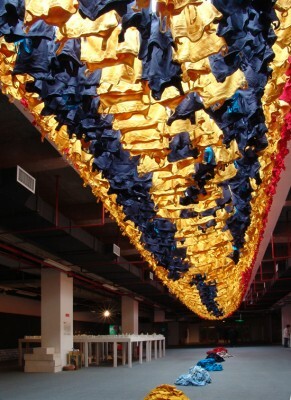 The installation is made up of over 15,000 pieces of clothing donated by American Apparel. It was developed by Ball Nogues, an American award winning design team consisting of architects Benjamin Ball, Gaston Nogues and Andrew Lyon. They challenge traditional architecture by interspersing elements of art and product design in their work. ‘Built to Wear’ is a perfect example of their philosophy. 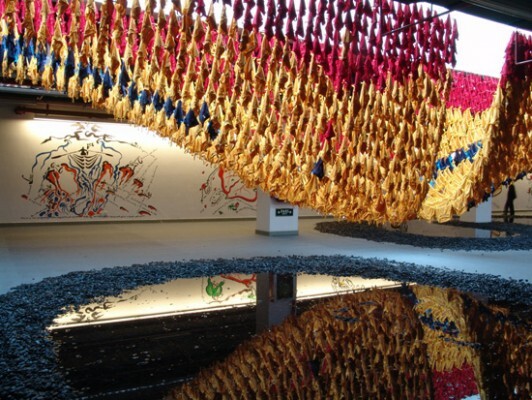 The garments function as building blocks to create a structure which is meant to be temporary. Visitors to the exhibit will inadvertently dismantle it because each person is invited to take a piece of clothing. 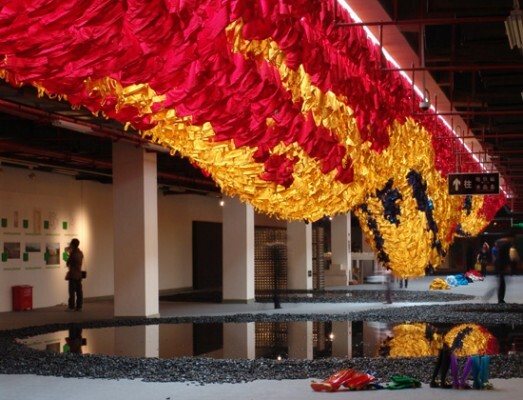 According to Ball Nogues, this addresses issues of permanence in our urban environments. 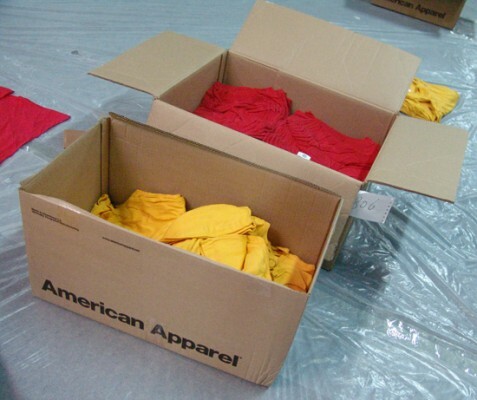 Additionally, the use of American Apparel clothing is significant. The company is in fact the largest garment factory in the United States. Factories are constantly being moved from developed countries to developing ones and ‘Built to Wear’ also functions to draw attention to the practice. Useful site. Nice piece of info, very informative and easy to understand. After study few of the blogposts on your web site these few days, and I truly like your style of blogging. I tag it to my favorites website list and will be checking back soon. Please visit my web site as well and let me know your thought. Thanks so much for this! I havent been this moved by a blog post for quite some time! You’ve got it, whatever that means in blogging. Anyway, You are definitely somebody that has something to say that people should hear. Keep up the outstanding job. Keep on inspiring the people! Thankx so much for this! I have not been this moved by a blog post for a long period of time! You’ve got it, whatever that means in blogging. Anyway, Youre definitely someone that has something to say that people should hear. Keep up the good job. Keep on inspiring the people! Wow! It’s like you understand my mind! You seem to know so much about this, like you wrote the book in it or something. I think that you could do with some pics to drive the message home a bit, besides that, this is great blog. A wonderful read. I will certainly return again. I was very pleased to find this site.I wanted to thank you for this great read!! I definitely enjoyed it.